Clean up space in your bathroom cabinets and drawers with this versatile bathroom organizers a little help! 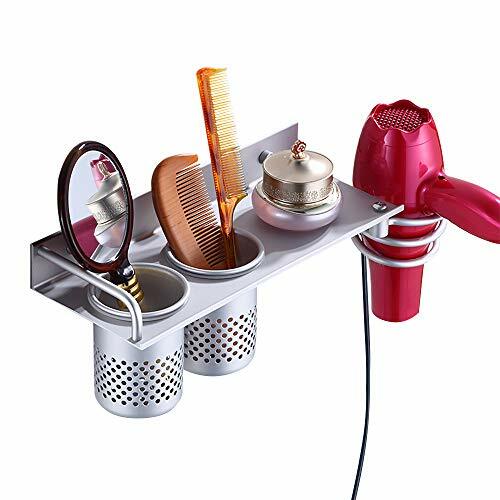 Organizers easy installation to the wall to save space and keep the hair dryer and toiletries, talent, suitable for bathroom or toilet, as long as you like. This frame allows your bathroom tissue while looking great at the same time. It has oxidized polished finish and durability combined with elegant, simple and modern style seamlessly integrated into almost any decor. Environment and made of high quality aluminum, which is made of the same material as the iPhone, the solid chassis with a durable, lightweight and rust-proof structure. 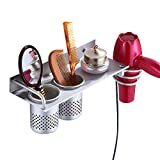 Multiple storage functions: 1, flat for your service; 2, cylindrical tank ventilation comb or brush collection; 3, W / L-slot plug and power cord. Any point can be your reason to get this versatile organizer! It has all types and sizes of hair dryers, in addition to those great mouth or focus. Please refer to the peak of size; care instructions: Clean with mild / mild detergent and non-abrasive cloth.